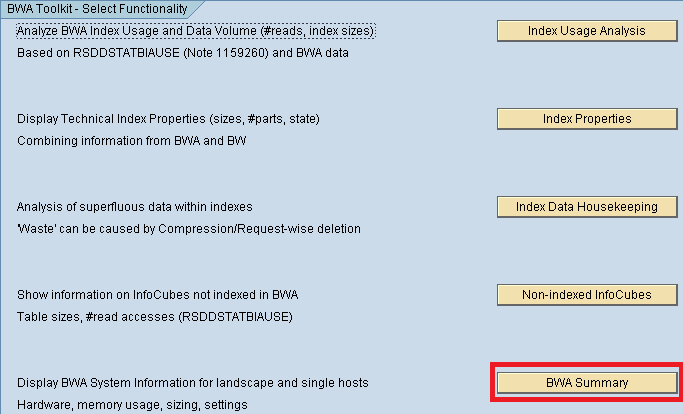 Martin Maruskin blog (something about SAP): BWA Fill Level what it is and where to find it? BWA Fill Level what it is and where to find it? Speaking of BWA you might heard already about one of its parameters. It is called fill level. Usually BWA guy is asking about that Basis (or even vice versa? J). 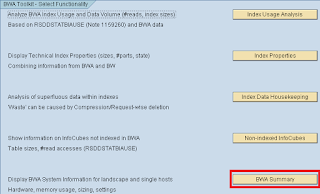 You may also hear that this parameter should be kept under certain value. Ratio of disk size of all indexes to installed RAM of all master blades, expressed as percentage of the amount of installed RAM of all master blades. SAP is advising (in the same note quoted as above) to keep this value under 50%. That would be to have BWA in correct sizing.